It’s Christmas in the palace! Nothing says a Royal holiday affair like drama, booze, heart break and secrets. Blood doesn’t matter when pride is on the line in this family. ‘Tis the season for back stabbings! Right off the bat Eleanor is daydreaming and breaks out singing ‘Winter Wonderland’ where Cyrus is Scrooge and Liam and Robert are fighting in reindeer sweaters. Some very impressive and intricate choreography goes down between Len and Jasper. Honestly, every episode needs to have at least one musical number from here on out. Back in reality, Helena wanders the empty halls of the palace thinking it’s the zombie apocalypse. Priceless. She finds Liam where he tells her he let the staff go for the holidays meaning the Royals must fend for themselves. This apparently is a hard task. Honorable mentions go to Cyrus, Eleanor, and Robert who pop into the dining room and ask if Helena and Liam are alive or the undead. Splendid. While everyone is pissed at Liam for making them actually do something for once, Helen tries to cook a turkey. Out of nowhere the lovely Spencer pops in the kitchen and offers his help. While searching for the Figgie pudding (which apparently is a big thing) they get it on in the wine cellar. The pudding falls onto Helena’s face and she gets a black eye. Classic. Finally Len and Jasper are in a good place, but not for long. An American journalist is in town to ruin the couple. She’s dug into Jasper’s past and tells him she will expose his true identity. Apparently she has a source and while Jasper thinks it’s his dead-beat dad back in the states, my vote is on Saint Robert. 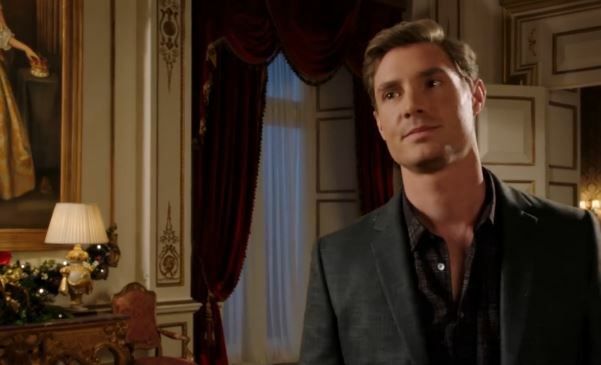 At the palace, Len and Liam confront Robert and tell him to admit he has a problem with Jasper. Instead, he tells Liam that the problem lies with him. Apparently poor Liam, who was trying to do a nice thing by letting the staff off, has left it up to Robert to fix everything and his highness wants a thank you. More drama occurs when Jasper returns and breaks up with Len. She was excited to give Jasper his gift, an original love letter from the couple they base their letters on. He tells her the relationship was suffocating him. What he really meant was the reporter got under his skin. My heart, like Len’s, is broken. Now that everyone has a chip on their shoulder, Robert makes a toast in his dad’s absence at Christmas Eve dinner that sets Liam off. Seriously no one in this family can be happy for five seconds. The only bright side to the dinner was seeing Mr. Hill sitting with the family enjoying his meal. The fighting makes for an uncomfortable situation, but the fact he doesn’t stop eating makes him my favorite. The only person who can save Christmas from the Royals is young Sarah Alice. She turns the night around after finding a bag full of gifts that was addressed from Simon (RIP). Everyone, but Robert, got a meaningful gift proving Simon was the best. Talk about ghost of Christmas past. Liam’s gift, boxing gloves, gave him the courage to go to Kathryn’s apartment and fight for her. Sadly for Liam (again) she turns him down for Robert. This guy just can’t catch a break. This sends Liam back to the palace where he challenges Robert to a boxing match for a charity event. He is literally going to fight his brother for a girl. Oh goodness this will be great.